Nails: Sally Hansen Salon Effects Nail Stripes "Amp it up!" Hello Lovelies! Hope you all are doing wonderful! It's officially Fall and I am so excited for Fall Fashion. In the next couple of weeks I will be transitioning some of my summer pieces into Fall outfits. Today's post features a pair of Fluorescent (Neon) Green jeans. During the summer I styled it by pairing it with a sleeveless top in a contrasting color and added a pair of black wedges. Transitioning the jeans into fall, I paired it with a shoulder cut-out denim shirt and added a pair of wedge booties. I am so excited to experiment and share more Fall transitions with you all. Hope you like this outfit...:) Thanks for stopping by, it means the world to me. HAVE A LOVELY WEEKEND! love the neon pants, u rocked them well. 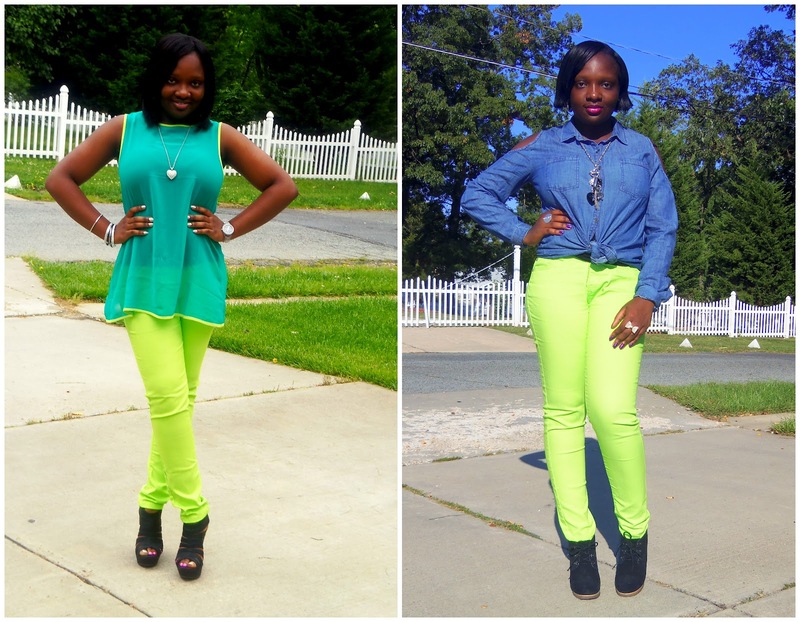 love the neon jeans! it's always great to use summer pieces and transition them into the fall! The color of those pants are amazinggg!! And your bag is so chic! Such a great fall transition. Love the booties! Love this outfit!!!! Great transition!